Interim Golden State Warriors coach Luke Walton, left, with Draymond Green and Stephen Curry at a Nov. 12 game against the Minnesota Timberwolves in Minneapolis. FiveThirtyEight’s 2015-16 NBA predictions post dropped on Monday and included, right up at the top, a detail remarkable enough to elicit a double-take from any NBA fan still fogging a mirror: the Warriors’ projected record. As of this writing it sits at a tidy 72-10 — as in the same 72-10 that MJ’s Bulls put up in the 1995-96 season, and the standing record for the most wins ever in an NBA regular season. By now there’s a whole cottage industry dedicated to handicapping the Warriors. On Monday, our colleagues at ESPN Stats & Info published an article about whether Golden State had a shot at breaking the 1995-96 Bulls’ record. They found that the Warriors had a 45 percent chance of getting to at least 72 wins and a 31 percent chance of at least 73. Our CARM-Elo projection is a little more bullish: It has the odds of 72+ wins at 54 percent, and 73+ wins at 44 percent. Golden State’s odds of hitting astonishing win totals — we’ve highlighted a few milestones in the table next to this paragraph, like the one-in-four chance the Warriors win at least 75 games — are probably a good deal higher than you’ll see in other models, or in the betting markets, where the Warriors are still about a 3-to-1 underdog to hit 73. That’s for — we think — a pretty good reason. One of the advantages of the CARM-Elo projection is that it allows runs of good play (in the simulation) to inform future performance, meaning hot and cold streaks can occur organically within the model.1 With CARM-Elo, the spread of potential season outcomes will be a little wider than in other models, as it’s a little more capable of assigning extreme outcomes when prompted by extreme performance. That’s helpful given that the Warriors are performing at the extreme reaches of professional basketball. Right now, they have an Elo of 1831, which is a franchise-high mark and the second-highest of all time, behind only the peak of Jordan’s ’96 Bulls (1853), who floated above the Warriors’ current mark for only four games in the ’96 playoffs. For reference, the Boston Celtics have the third-highest franchise peak ever, at just 1816. A falling piano could take Steph Curry’s size 13s off at the ankle on his way to the arena tonight, and Golden State’s sustained level of play this season would already put it right there at the top of the short list of great NBA squads. Still, bear in mind: Sensitivity to excellence (and awfulness) doesn’t mean the model simply takes the current data and makes it the new baseline. Case in point: The projection depresses the 2015 Dubs’ point differential of 14.9, which would be a record, to an average of 12.6 across all 10,000 simulations. This is the expected outcome once the model takes into account regression to the mean, a bigger sample size and all the other flattening effects near to disbelievers’ nagging hearts, yet it’s still a few ticks higher than the second-place mark of 12.3, set by the 1971-72 Lakers. What the model can’t account for is the possibility that Golden State clinches home court some time around the trade deadline and suspends its starting five in carbonite. But then, that isn’t really what we’re looking to measure here, anyway. “Will the Warriors break the record, given all the external incentives not to?” is a much less interesting question than can they. To answer the latter: There’s a damn good chance they can. Hot Takedown wonders: Just how good are the Warriors? Conversation begins at 13:20. Subscribe to all of FiveThirtyEight’s podcasts here. 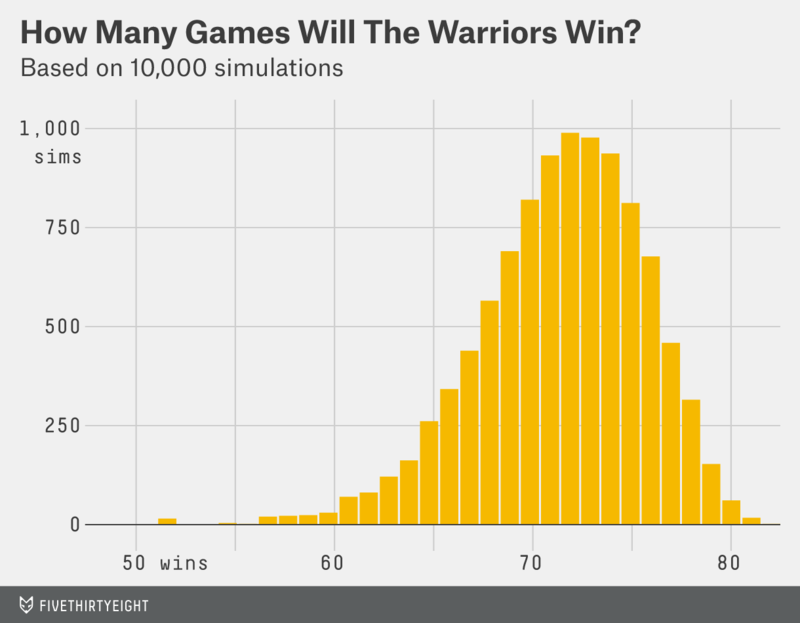 This happens because the model adjusts each team’s Elo rating after each game in the simulation. So if a team wins one simulated game, its rating goes up, and it is slightly more likely to win the next. When it loses a game, the same is true in reverse.